1O God, why do you cast us off forever? Why does your anger smoke against the sheep of your pasture? 2Remember your congregation, which you acquired long ago, which you redeemed to be the tribe of your heritage. Remember Mount Zion, where you came to dwell. 3Direct your steps to the perpetual ruins; the enemy has destroyed everything in the sanctuary. 10How long, O God, is the foe to scoff? Is the enemy to revile your name forever? 11Why do you hold back your hand; why do you keep your hand in your bosom? 12Yet God my King is from of old, working salvation in the earth. 18Remember this, O Lord, how the enemy scoffs, and an impious people reviles your name. 19Do not deliver the soul of your dove to the wild animals; do not forget the life of your poor forever. 20Have regard for your covenant, for the dark places of the land are full of the haunts of violence. 21Do not let the downtrodden be put to shame; let the poor and needy praise your name. 22Rise up, O God, plead your cause; remember how the impious scoff at you all day long. 23Do not forget the clamor of your foes, the uproar of your adversaries that goes up continually. I vividly remember one of our Old Testament professors teaching us about the Laments – the most common type of psalm found in the collection. They’re cries to God when life is harsh and unfair. And you can tell as you read them that many of the laments are due to unanswered prayer. It’s evident in these psalms that it’s not the first time the person has prayed about the situation. This New Testament passage from the Apostle Paul refers to lamenting prayers in his life. To keep me from being too elated, a thorn was given me in the flesh, a messenger of Satan to torment me, to keep me from being too elated.8Three times I appealed to the Lord about this, that it would leave me,9but he said to me, “My grace is sufficient for you, for power is made perfect in weakness.” So, I will boast all the more gladly of my weaknesses, so that the power of Christ may dwell in me. 10Therefore I am content with weaknesses, insults, hardships, persecutions, and calamities for the sake of Christ; for whenever I am weak, then I am strong. Unanswered Prayer is a heavy subject. Every time I started to work on this message this week, I felt an inner fatigue, because when you think about unanswered prayer, it takes you painful places in the memory of your heart. So let me start with this story. A little boy wanted a new bicycle for Christmas. Weeks before the holidays he started praying for it, every single day. But Christmas came, and there was no bike. The boy’s birthday was late January. So he continued to pray for that bicycle. Much to his surprise, he did not get a bike for his birthday. Nor did he get one on Valentine’s Day or St. Patrick’s Day, which was a big holiday in his family. So one night, the boy snuck out of his house and went down the street to his church. Unanswered prayer is hard, isn’t it? It’s a struggle that each and every one of us can relate to. We’re taught to believe in prayer. We’re taught to pray often – faithfully, diligently. We’re taught to believe that prayer makes a difference, that God answers prayer. Many times, or at least some times, we feel better after we pray – closer to God perhaps, and with a little bit more peace in our hearts. We’re people of prayer. But sometimes our prayers go unanswered. And usually it’s related to things far more serious than a bycycle. Let’s first think about the obvious point that God can not answer all of our prayers. Ex. A field goal kicker lines up to kick a last second field goal. Some of his teammates kneel and say a quick prayer that it goes through the uprights. On the other side some of those players kneel and either pray that he misses or that it gets blocked. What is God to do!!!! Ex. 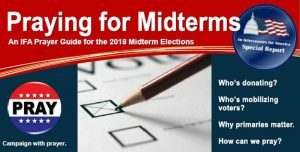 In the world of politics – both sides pray for their candidate to win, but they can’t both win. Ex. In the world of dating, a young man is praying that a certain young lady would recognize that they’re meant to be together forever. And that same young lady is praying that he would realize they’re not meant to be together and that he’d move on with his life. God can’t answer both prayers. Ex. 12 people apply for a job, and 12 people are praying they get the job. But they can’t all get it. 11 of them will have their prayers unanswered. Ex. 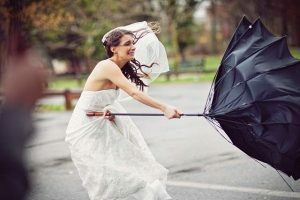 In June, the brides pray for sun shine on their wedding days, while the farmers pray for rain. God can’t answer all our prayers! Sometimes I thank God for unanswered prayer. Just because he doesn’t answer, doesn’t mean he doesn’t care. Some of God’s greatest gifts are unanswered prayer. That’s true, but it’s also true that some of our greatest heartaches are unanswered prayer. 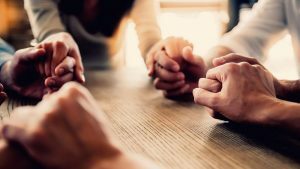 We can take some comfort and solace in the fact that the greatest faith-filled people in the Bible also had to wrestle with unanswered prayer. Moses prayed that he could lead the Israelites over the Jordan River and into the Promised Land. He prayed this: “Let me cross over to see the good land beyond the Jordan, that good hill country and the Lebanon.” (Deut. 3:25) But that prayer wasn’t answered. Moses died, and young Joshua had to lead the people across the Jordan and into the Land of Promise. King David, is described in the Bible as “a man after God’s own heart.” His prayer life was so rich that half of the psalms are credited to him. When David’s young son was sick, he prayed and fasted for 7 days, but the child died. David’s prayers went unanswered. David also prayed that he’d be able to build a great temple for God in Jerusalem. But God did not allow it, and it was left to David’s son, Solomon. The great prophet Jeremiah prayed that Jerusalem would not be destroyed. 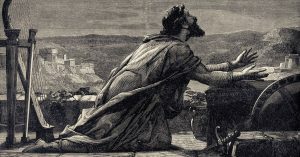 St. Paul, the human being most responsible for spreading Christianity like a wild fire through the ancient world – St. Paul wrestled with unanswered prayer. He called it his “thorn in the side.” It was some sort of physical ailment that caused him embarrassment, and three times he asked to be healed. But his prayers went unanswered. Do you know who else had to deal with unanswered prayer? That prayer has clearly gone unanswered. Just think of all the schisms, division, infighting among Christians & churches. Someone once estimated that in the history of our faith there have been over 34,000 different denominations & sects of Christians. 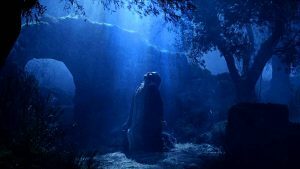 In the Garden of Gethsemane Jesus asked God if there was another way to accomplish his mission. And the answer was no. Later that night he would tell Peter that he would pray for him, so that Peter would keep the faith when tested. Peter failed that test. Jesus’ prayer for Peter went unanswered. So unanswered prayer is not a new thing, it’s not a modern phenomenon. This side of heaven it seems to be a part of the faith experience. Of course, that’s why it’s called faith. That’s why faith is required. If we could manipulate God to make God give us everything we want, God really wouldn’t be God. We wouldn’t have a faith. We’d have black magic. That kind of magic is people trying to manipulate the gods. But our faith is about honoring God, serving God and loving our God. As a footnote to this message . . . Some suggest that these promises may have been just for Jesus’ disciples during these foundational days of the birth of the church. You don’t find these kind of promises anywhere else in the Bible – not in the Old Testament, nor in the letters of St. Paul. – so one could conclude they were meant just for the original disciples. So, if there are no guarantees that our prayers will be answered, and it’s basically a coin toss whether they will or not, why pray? 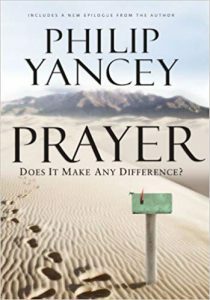 Philip Yancey in his book on prayer, entitled, “Prayer: Does It Make Any Difference,” gives a number of reasons why prayer is a good idea, even without the promise of success. His first answer is so simple, but I never really thought about it. Yancey says we should pray because Jesus, our Lord & Savior, prayed regularly. And he didn’t just pray as an example for us. He prayed because he needed to! 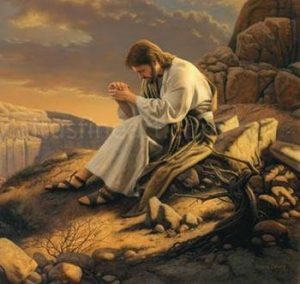 The night before choosing his 12 disciples, he pulled an all-nighter in prayer up on a mountaintop, asking his Heavenly Father for help in selecting his team. Some might question how well God answered Jesus’ prayers that night. But the point is Jesus depended on prayer. He talked to God as he went about his ministry, and prayed especially hard in times of hardship and crisis, and simply big moments in his life – his baptism, choosing the disciples, the Transfiguration and facing the Cross). Point being – if Jesus Christ, the Son of God, felt the need to pray, then it’s likely that it will benefit us as well! If Jesus felt that prayer made a difference for him, then I certainly have to believe that for myself as well. Secondly, Prayer keeps us connected to God, even if those prayers include anger directed at God, at least you’re still doing life with God, and that’s a good thing. Prayer helps us rebound, reorient our lives when our initial prayers don’t get answered. 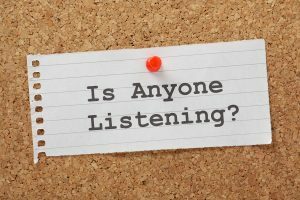 The Apostle Paul was able to rebound from his experience of unanswered prayed. He saw that God was still at work. He realized that God could work through him in spite of his physical struggles. God’s grace was enough, it was sufficient for Paul, even if it wasn’t his first choice. He even reframed it, that God’s strength could be seen even more in Paul’s weakness. Well, that’s enough for one day . . . 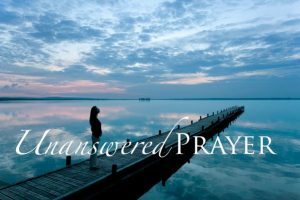 There are no easy answers when it comes to the question of unanswered prayer. Does God answer prayer? Is one question. Will God answer my specific prayer for my sick loved one? is another question. Between those two questions lies the mystery of unanswered prayer. 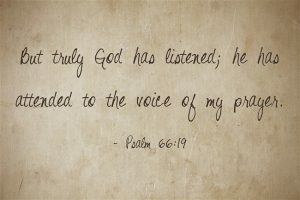 Lord Jesus, you knew the heartache and struggles of unanswered prayer when you walked this earth. Help us to keep praying, even when our prayers seem unanswered. Help us to keep trusting, even when we have to walk by faith and not by sight. As someone once said to you, “We believe. Help our unbelief.” These things we pray in your holy, precious name. Amen.